Making breakfast is my favorite meal to cook. In our house it happens on Saturdays & Sundays. 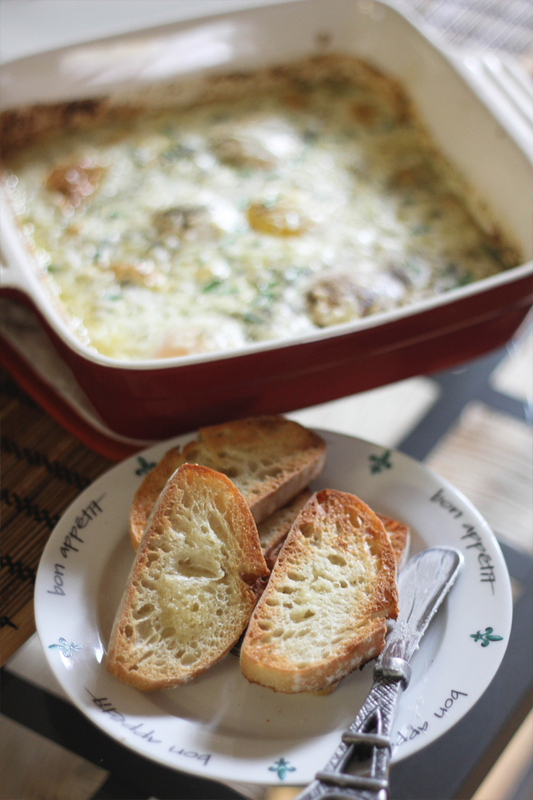 A few Sundays ago I made Ina Garten's Herbed-Baked Eggs & they were delicious. I paired the dish with lightly toasted crostini & some turkey sausage (because that's what Luke likes). 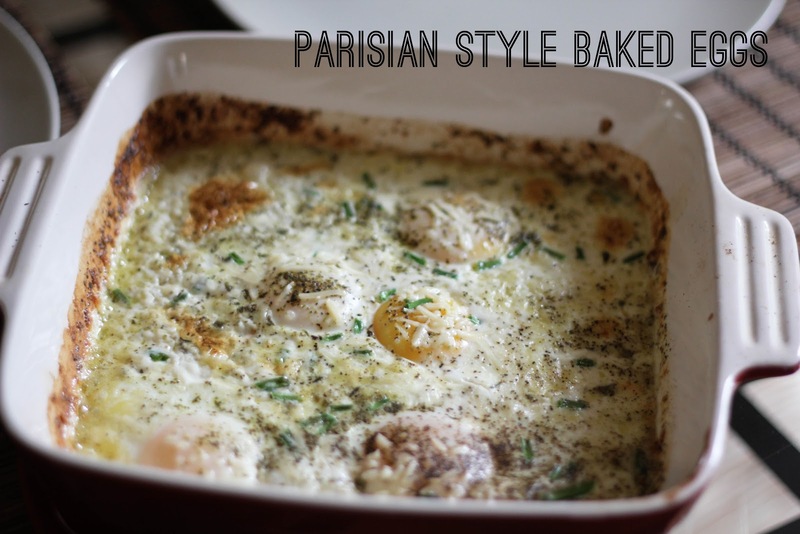 I call these Parisian Baked Eggs because they're from Ina's Barefoot in Paris cookbook. It also sounds slightly more elegant when you sit down at the table for breakfast, to nosh on Parisian style baked eggs. Don't you think? Place the cream & butter in a baking dish & place under the broiler for about 3 minutes, until it's hot & bubbly. Quickly & carefully pour the eggs into the baking dish & sprinkle evenly with the herb mixture, then sprinkle liberally with salt and pepper. Place the dish back under the broiler for 5 to 6 minutes, until the whites of the eggs are almost cooked. The eggs will continue to cook after you take them out of the oven. Allow to set for 60 seconds and serve hot with toasted bread. *click on the link I provided above for Ina's recipe. The recipe I typed up is my adaptation of the recipe. Those eggs look delicious. The French do love their eggs. Breakfast is my favorite meal to cook too! I love eating breakfast for dinner. i. love. eggs. but have never tried baking them? this looks delicious though! Aaaaand I HAVE to make these. Oh my goodness, these look so good! What a classy little brunch dish! How do you think this would work if I made it for a buffet brunch? Can it sit awhile and still be good?